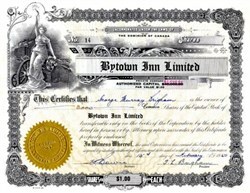 Beautifully printed certificate from the Bytown Inn Limited issued from 1949 - 1973. This historic document has an ornate border around it with a vignette an allegorical woman holding a light in front of a generator and building. This item has the hand signatures of the Company’s President ( T. L. Brighham ) and its Secretary. 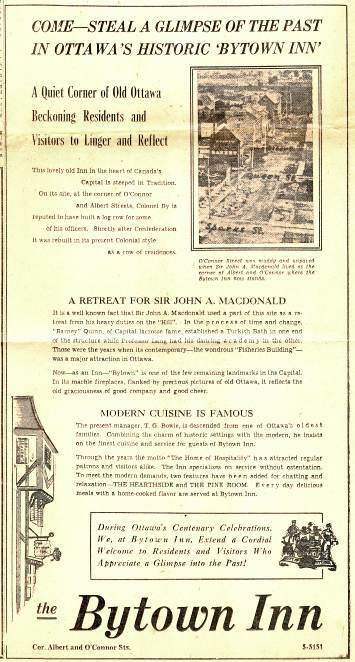 The Bytown Inn was probably the oldest hostelry in Ottawa. It was something of a landmark, if not a monument of the city. It was quaint to say the least. A Quiet Corner of Old Ottawa Beckoing Residents and Visitors to Linger and Reflect. This lovely old Inn in the heart of Canada's Capital is steeped m Tradition. On its site at the corner of O'Connor and Albert Streets, Colonel By is reputed to have built a log row for some of his officers. Shortly after Confederation it was rebuilt in its present Colonial style as a row of residences.